A Studio 450 Wedding Photographer is able to capture moments that include incredible skyline views. Studio 450 is a prime New York City wedding location. The venue is perfect for couples who want a classic and elegant Big Apple celebration. The studio is most known for its big, open windows that look out over the city. An evening wedding will take the breath away of those who attend as they look out over the bright city lights. As a Studio 450 Wedding Photographer it is important to make sure that the little details do not get overlooked. Some of these details include the wedding attire of the bride, groom, and their bridal party. In this image, the uniqueness of the groom’s suit shows off the personality of the couple and helps make their day a more individual experience. This close up brings attention to the details in the design of the groom’s shirt. He did not chose to wear a traditional white, dress shirt; instead the groom donned a white shirt that was speckled with small blue circles. Also seen more clearly are the treads of his pale red and white tie and the detailed stitching of his soft gray suit. 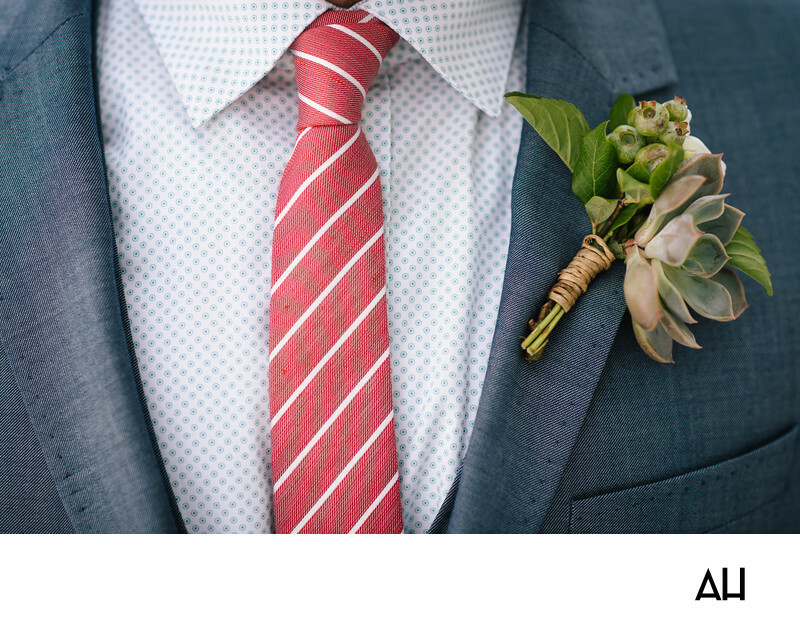 These items pair wonderfully with the simple charm of the boutonniere pinned to the suit lapels. The boutonniere is made of flora that contain tones of green and white, and their stems are brought together with twine. In most photographs, the bride’s gown steals the show, but the groom’s attire deserves some notice as well. Especially when he opts to wear something that is not in line with traditional apparel.